I started this sampler with whipping eight long chains in the first sample. The whipping is done hallway on the seven long tail chains in the second sample. Whipped long tailed chains are combined with detached chain in the third sample. Long tailed chains are alternated with pistil stitches and then whipped in the first sample. Quarter buttonholes are alternated with this stitch in the second sample. 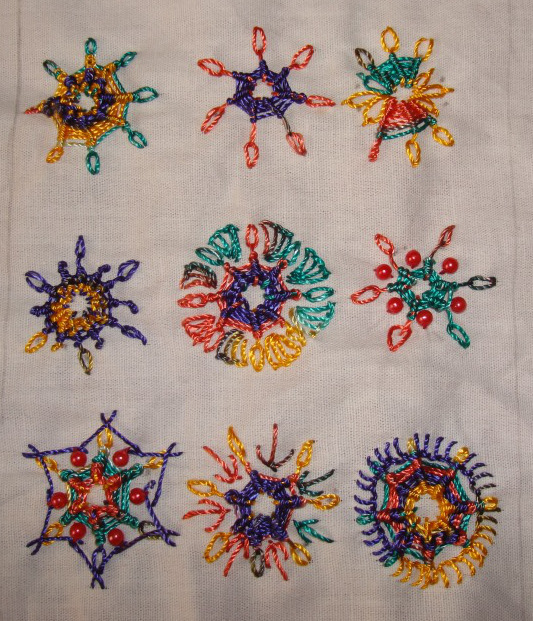 Beads are added to the third sample. Herringbone stitches and beads are added to the first sample. Fly stitches are worked between the long tailed chains in the second sample. This stitch is outlined with buttonhole stitch in the last sample. This stitch opens new possibilities to work in circles. I was keen to see the effect of the multi colored thread on this stitch. 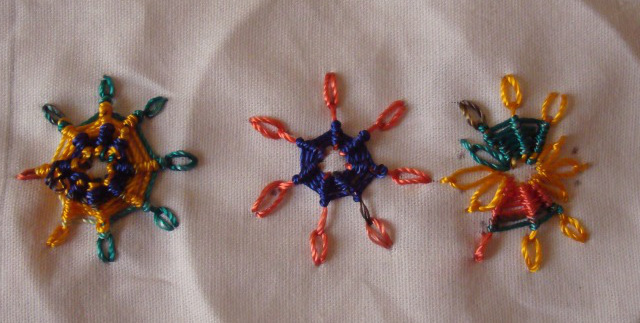 Mandalas can be worked with this stitch as the centre.